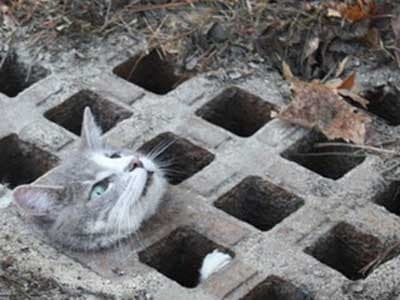 At UKDN Waterflow (LG), we’ve seen more than our fair share of strange things in the sewers and drains in which we work. Sadly, from time to time our teams have encountered animals who have made the sewer system their temporary home or have simply become stuck, meaning a rescue operation is required. Probably the least surprising entry in this list, rats (typically brown rats) often live in sewer systems, where they can travel freely and access shelter, food and water. And we tend to unwittingly attract them by discarding food and fat down drains, significantly increasing the chances of infestation. Rats make themselves at home in drains and sewers and this is clearly demonstrated by the nest that this rat has made from wipes and sanitary napkins in this manhole chamber, you can clearly see the female rat heading back to the nest as the manhole lid is removed. 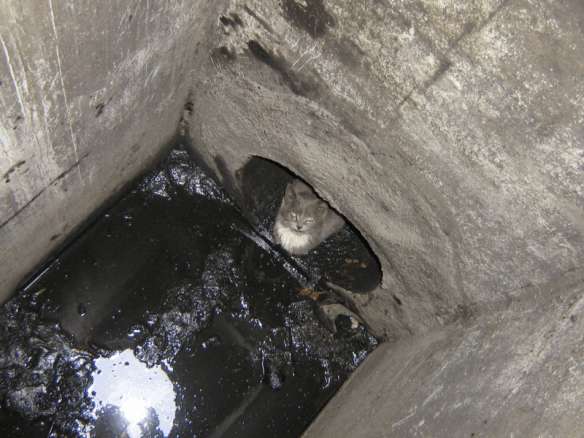 All too often humans make the drains and sewers very comfy for the rats by discarding items into the drainage system that should never ever be put down drains. Rats can cause real problems in sewer systems because their ultra-strong teeth are capable of chewing through concrete and consequently causing considerable structural damage. 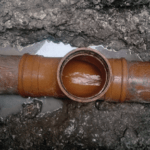 UKDN Waterflow (LG) provide CCTV surveys to identify the defective pipework and offer repair solutions, such as patch liners to cover the broken or displaced joint removing access for the rats. Details of the surveys available can be found here. Ever heard the phrase “like a rat up a drainpipe” to mean to act or move very quickly? Well, that’s appropriate because rats can move around drains and sewers with exceptional ease. They are amazing swimmers (they can tread water for three days straight!) and have hinged ribs to allow them to fit through the tightest of spaces. Watch the video below to see this in action, and find out how easily they could wriggle up your toilet. Having described this problem, it is very unusual for rats to have the courage to actually do this in most properties. 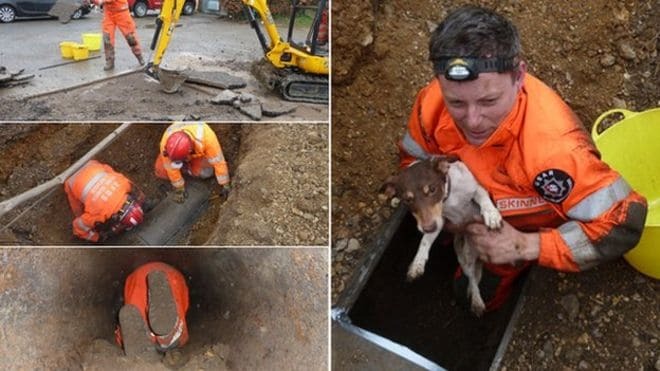 In 2015 our team were called out on behalf of Thames Water to help firefighters search for a pet dog who had chased a fox down a disused drain pipe. We used a high-tech drainage camera to search for the little Jack Russell but quickly found the pursued fox in the drain instead. At that point the pet pooch appeared behind us, completely fine after its high-speed chase, allowing us to focus on making sure the fox (pictured below) would be able to get out of the drain too. 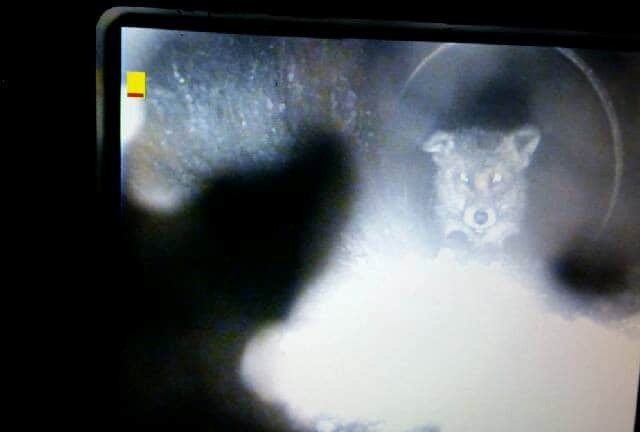 Back in 2012 our engineers caught sight of a ferret in a pipe while on a routine cleanse and survey project. After coaxing it out of harm’s way with a chicken sandwich (what else?) our team captured the critter as the RSCPA arrived. It turned out the ferret belonged to a pub, where it was working as a pest controller. Needless to say the owner was delighted to be reunited with his furry friend! 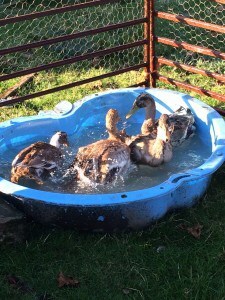 In the winter of 2015 we helped a farmer in South Wales rescue a flock of ducks that had disappeared down a pipe in the garden and remained down there for a week. We loaned the owner a mini-excavator to help dig up the surface water drainage system, and, lo and behold, there were the ducks, looking a bit shaken up but thankfully not too worse for wear. 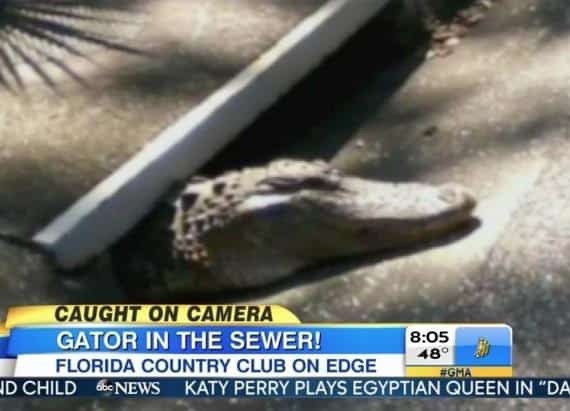 However, there has been very little evidence to support the well-worn theory that alligators actually do live in the sewers, and any mention since has been filed under the category of ‘urban legend’. In fact, New Yorkers are so proud of this urban legend that 9th February marks the city’s annual ‘Alligators in the Sewers Day’. That said, there appear to have been some genuine reports of alligators found in the sewers elsewhere in America. 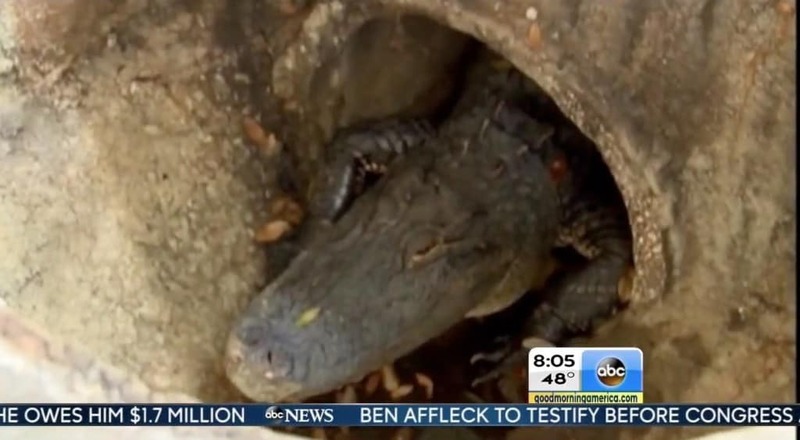 These images from a Good Morning America broadcast appear to show a true sewer alligator being caught on camera in Florida. Eels typically live in the shallow waters of oceans and rivers and tend to burrow in the silt, sand and mud at the bottom of the rivers and oceans. The majority of eels are nocturnal and are rarely seen. Eels sometimes find their way into drains and sewers by swimming upstream in the discharge pipes, especially if those pipes have silt at the bottom on the pipework. Desilting of pipework normally flushes them back into the discharge pipes and back into the oceans. Unlike rats and alligators, no one would believe you if you suggested cows live in the sewers. But that doesn’t mean they’ve not been found down there. 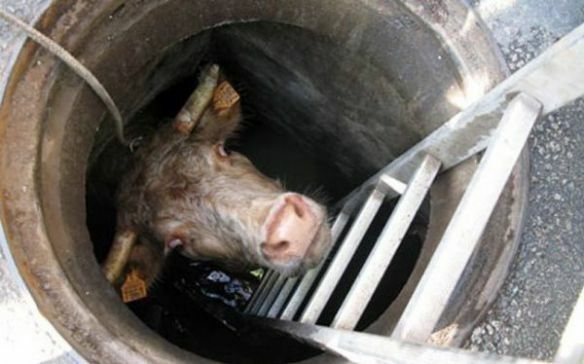 The poor cow below apparently fell into the drain after escaping from an abattoir in northern France. 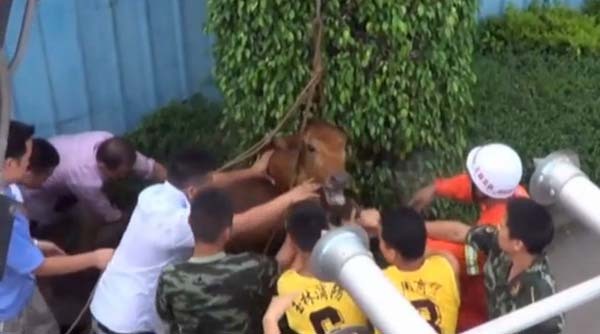 China’s Guangxi province was the location of another case of cow in a drain. 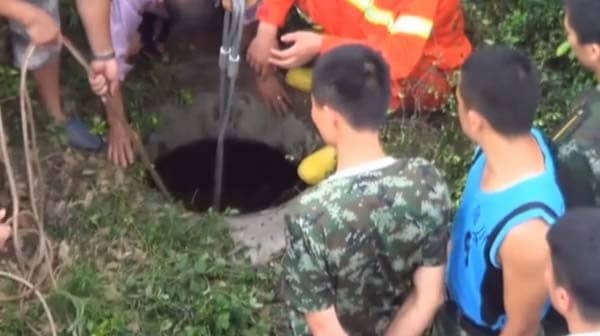 After two days of searching for his lost cow, which had run away from its farm, the owner heard ‘mooing’ at the bottom of a drain. It took many helpers and a complex pulley system to rescue the cow, as the images below show. The idea of lifting a toilet lid to find a snake in the toilet bowl is the stuff of nightmares for many ophidiophobes (people who are scared of snakes). But it isn’t pure fantasy – it is true, although unlikely, that snakes can find their way into toilets and bathrooms from sewer systems. Another interesting species found by our engineers are frogs. The sheer amount of animals our engineers find is off the scale, and lizards are no exception. As the saying goes, curiosity killed the cat, and we’ll often come across moggies that have let their curiosity get the better of them. Not to be outdone by their rivals, dogs, like cats, also find themselves in places they shouldn’t be. Some domestic dogs find themselves there by accident, while homeless dogs in large cities often head to the sewer systems for shelter and food. These little critters aren’t native to the UK, but are common across North America. Raccoons don’t live in sewers or drains, but will often use them to find food or navigate to other sources of food. However, as the images below show, sometimes they can get stuck when they’re particularly hungry. 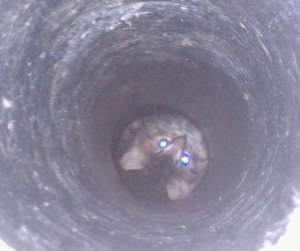 In 2009, a video taken by a snake camera during an inspection of the sewer piping below the Cameron Village shopping center in North Carolina went viral. The reason for its popularity? It proved the existence of sewer monsters. Well, that’s not strictly true, but as you can see from the video below, the camera picked up footage of a pulsating blob-like fleshy substance that captured the imagination of the public, who wanted to know the identity of the creature.